For part of the year, my wife has a gig that brings us into northern Alberta. To save money and make the most out of being here, we live off the grid in our RV for weeks at a time, relying on our rig's power system, propane and water tanks to keep us going. I connect to the internet through my T-Mobile phone plan. It’s quiet, I have a beautiful view of the Rocky Mountains and, when I want to go for a hike in the woods, all I need to do is grab my bear spray and step outside. There’s just one thing I’d change about being out here. They’re plentiful enough that I can’t step foot out of the RV without for more than a minute in the late afternoon without being chewed on, instantly. They’re small enough that, even when I haven’t opened the door in 24 hours, they still manage to find a way inside. Today’s been a bad mosquito day: we had some pretty heavy rain last week, which resulted in a lot of big puddles being created around where we camp. Mosquitoes breed in standing water. There’s thousands of the little bastards outside right now. Despite having stuffed paper towel into the space between all of my screens and windows to buttress the weather stripping that’s already there, I’ve killed 12 of the buggers since I sat down to work, just over an hour ago. On days like this, I break out my Thermacell and set it up inside. 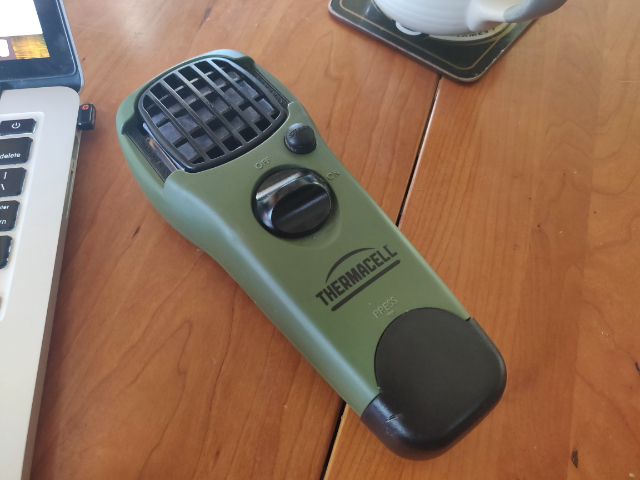 A Thermacell is a device (they pack the technology into a wearable, a bunch of lanterns and a table topper, too) that runs on butane cartridge. The butane provides the juice to power a small burner inside the device, which, as burners do, burns and generates a little bit of heat. This heat is used to scorch a disposable pad impregnated with Allethrin, a synthetic version of a naturally occurring repellent found in chrysanthemum flowers. Mosquitoes hate this stuff. It smells like nothing to me. Within a few minutes of turning my Thermacell on, the mosquitoes that were using me as a buffet inside of the RV, vanish. I can leave the windows open. I can get work done with out slapping a bug out of the air every 30 seconds. It’s bliss. That said, it can be sort of useless outside, sometimes. On a breezy day, the scent of Allethrin it generates gets blown away, leaving you to contend with a horde of bloodsucking freeloaders. But, with the way that I use it, I don’t really need to worry about that, unless it’s hot enough to warrant turning on a fan. The only thing I can say against my Thermacell is that the cost of consumables for it is pretty steep. A box of scent pads and the butane to run it for 48 hours costs around 30 bucks, in Canada. But, given that I only use the device maybe once or twice a week for a few hours at a time, for a six-month period, I look at it as part of the cost of doing business whilst living a nomadic life. How to Do Nothing: Jenny Odell's case for resisting "The Attention Economy"